Consolidated Communications, which provides broadband to homes and businesses in northern Vermont, announced this month an agreement with the International Brotherhood of Electrical Workers and the Communication Workers of America. The three-year agreements were ratified by the two unions Aug. 10. “Since our acquisition of FairPoint a year ago, we have seen a notable improvement in the relationship between the unions and the company, and this agreement reflects that progress,” said Bob Udell, the company’s president and chief executive officer. Rose Computer Technology Services of South Burlington hired Richard McEntire as a network engineer in July. The hiring is part of the company’s expansion of IT services for businesses, including computer support, network services and IT consulting. McEntire has worked in systems administration, hardware, software, IT consultation and support for more than 19 years. Prior to joining Rose, he served as a systems administrator for Northern Power Systems. His primary responsibilities will include network support, firewall administration and project deployment. Small Dog Electronics Founder and Chief Executive Officer Don Mayer announced this month that he is retiring and seeking new ownership or partners for the company. Based in Waitsfield, the company has stores in Waitsfield, South Burlington and Key West, Fla. It focuses on government and retail sales of Apple products. Inquiries can be directed to Emily Dolloff at Emily@smalldog.com. (Shown left to right): Boys & Girls Club of Burlington Executive Director Tanya Benosky, Ninety Nine Restaurant General Manager Ian Kvam, Ninety Nine Restaurant Service Manager Carol Morey, Hostess Kate Johnston and Kitchen Manager Erica Van Alstyne. 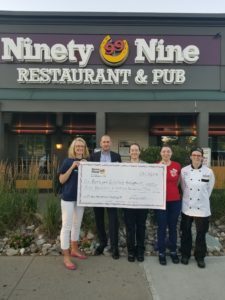 The Ninety Nine Restaurant & Pub in Williston celebrated its 15th anniversary in July, raising nearly $1,000 for the Boys and Girls Club of Burlington. The celebration included trivia and recognition of the restaurant’s staff. A percentage of sales during the day were donated to the charity, with General Manager Ian Kvam presenting a $986 check. All Breed Rescue of Vermont was awarded $1,500 in July from the Petco Foundation to support the nonprofit’s work saving adoptable dogs from high-kill shelters. The grant will help All Breed evaluate and transport dogs pulled from out-of-state shelters and prepare them for adoption. More information is available at allbreedrescuevt.com and petcofoundation.org. DEW Construction of Williston has hired Brian Gallagher as director of business development. Gallagher has been active in the construction management and real estate industries throughout New England for over 25 years. Most recently he was director of business development with Sullivan Construction of Bedford, N.H. The hiring helps DEW’s efforts to open an office in southwestern New Hampshire. Visit dewcorp.com for more information. Encore Renewable Energy of Burlington recently announced the hiring of Sonia Johnson as project manager. Johnson comes from a background in solar data management and the manufacturing of industrial power generators. She has worked for Draker Corporation and Rolls Royce Canada. She will be counted on to boost Encore’s project development and construction capabilities.